Albert Einstein (1879-1955) was, among many other things, a master of the aphorism. Here are three of them that hold true for writers. "Imagination is more important than knowledge." Is it any wonder that Mary Shelley wrote Frankenstein by age 20, and Carson McCullers wrote The Heart Is a Lonely Hunter by 23? They could not have been so full of wisdom by their age, but they were surely full of imagination. Writers need to start from this premise. "Once we accept our limits, we go beyond them." Writers need to know what they don't know and then get it, if they are to expand to points of reference, depth of insight, and command of language. "Anyone who has never made a mistake has never tried anything new." Pete Rose had more base hits than anyone in baseball history, but he also made more outs. Thomas Edison failed in inventing electric light more than a hundred times before he succeeded. Writers need this reminder: create fearless of failing, transform those failures into successes, and expect failures again. At least you're trying. Enjoy the experience. English critic John Ruskin (1819-1900) once wrote, "Say all you have to say in the fewest possible words, or your reader will be sure to skip them; and in the plainest possible words or he will certainly misunderstand them." Ruskin renders two suggestions: make every word count and keep it simple--great advice from a prolific writer who speaks from experience. Here are some quotes from great writers collected by Thought Catalog that will either make aspiring writers laugh or crush their spirit. My favorites are from Paul Theroux ("My advice to any young person who wants to write is: leave home"), Harper Lee ("I would advise anyone who aspires to writing career that before developing his talent he would be wise to develop a thick hide"), W. Somerset Maugham ("There are three rules for writing a novel. Unfortunately, no one know what they are"), and the best, Stephen King ("If you don't have the time to read, you don't have the time--or the tools--to write"). 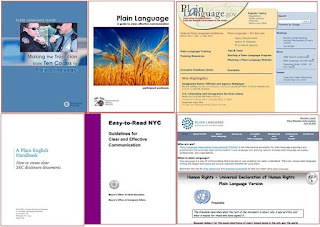 I am honored to have designed and delivered for the City of New York a Writing on Plain Language workshop, which is now available to all City government agencies. In past WORDS ON THE LINE posts, I discussed Plain Language principles at length: the need, paragraph focus, heading and list logic, thoughtful transitions, managing runaway sentences and clipped sentences, active voice, parallel structure, and word choice. So it's great to know that an organization as large as the New York Citywide Training Center has moved ahead with my program. The initial response from the hundreds of employees who have taken Writing in Plain Language has been exceptional. The highly customized nature of the course and its focus on individualized feedback have made it the most popular writing course for the City.